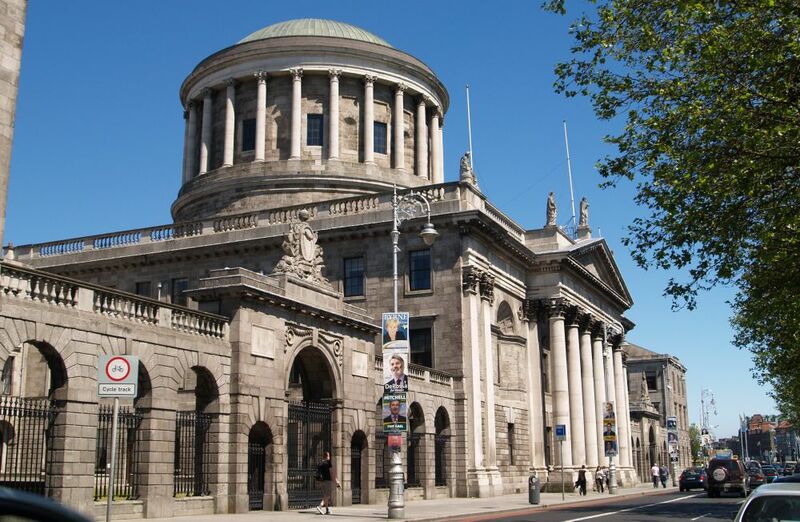 The Four Courts on the banks of the River Liffey are still used for its original legal functions. The patched up columns (filled in bullet holes!) are the result of damage incurred in the 1922 civil war. The Four Courts (Irish: Na Ceithre Cúirteanna is Ireland's main courts building, the building being located on Inns Quay in Dublin. The Four Courts house the Supreme Court, the High Court and the Dublin Circuit Court. 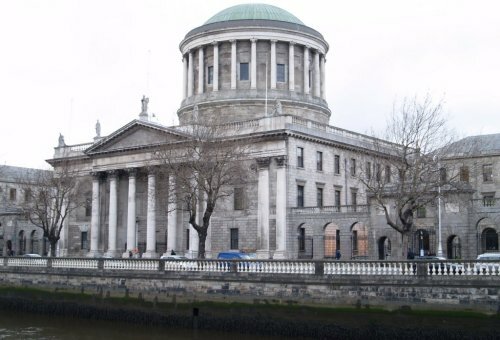 Until 2010 the building also housed the Central Criminal Court. The General Post Office in O'Connell Street. 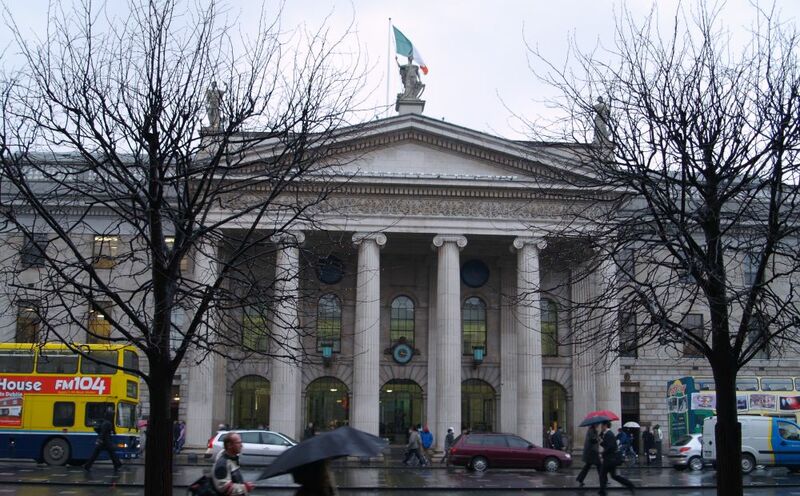 The GPO was the centre of the 1916 rising. 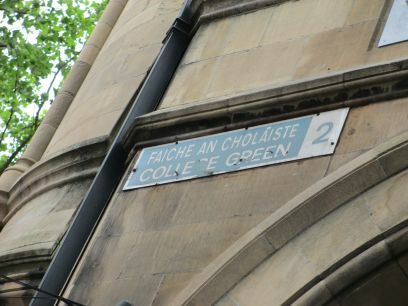 It was here that James Connolly and Padraig Pearse barricaded themselves inside and issued the Republic proclamation. 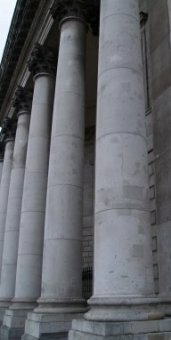 The GPO, with its imposing ionic portico, was one of the last great buildings of the Georgian boom, but look for the bullet holes in the columns! The Greek hexastyle portico of the General Post Office, was completed in 1818. The Royal Coat of Arms, similar to those at King's Inns and the Irish Houses of Parliament, was removed after independence. 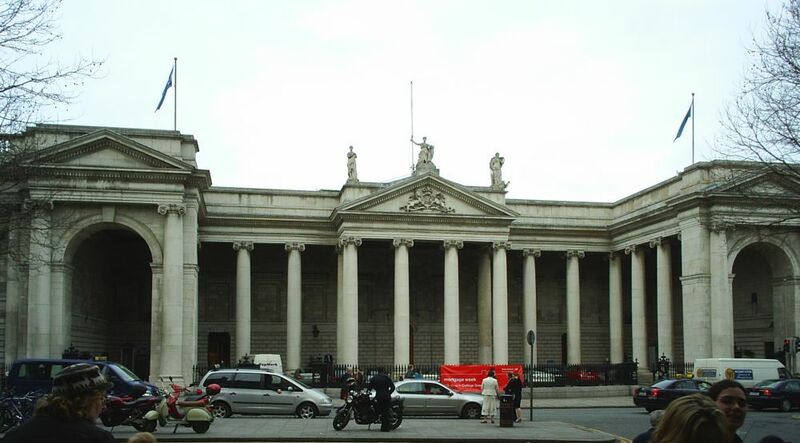 On the acroteria of the pediment of the GPO are three statues by John Smyth: Mercury is on the left, with his Caduceus and purse; Fidelity is on the right, with a hound at her feet and a key held in her right hand and Hibernia in the centre, resting on her spear and holding a harp. 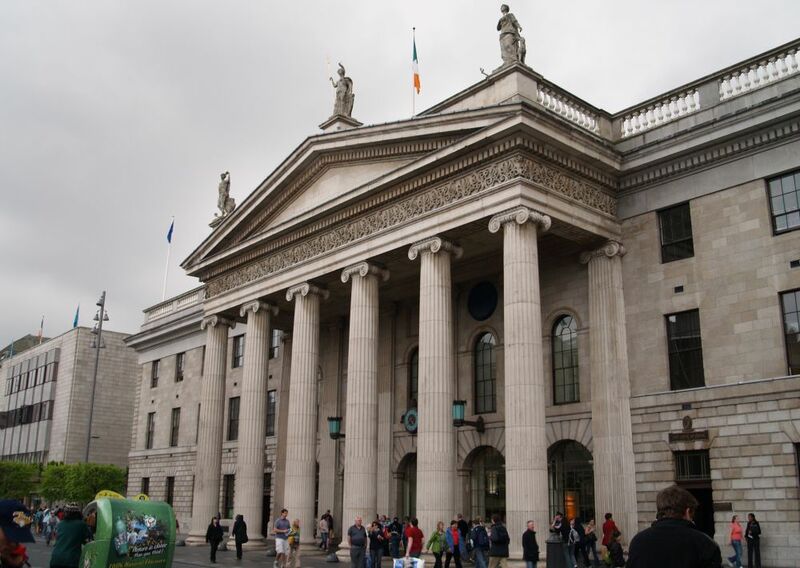 The Bank of Ireland near College Green, was the original parliament building. It was the first great Palladian style building in Dublin, designed by Sir Edward Lovett Pearce and built between 1729-1739. Its considered one of the best, perhaps the best? 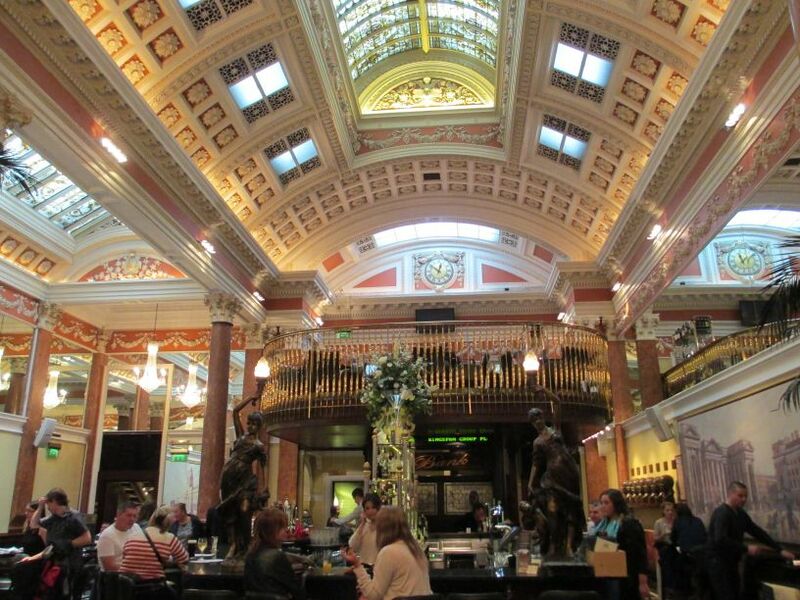 architectural gem of its period, of Dublin City. 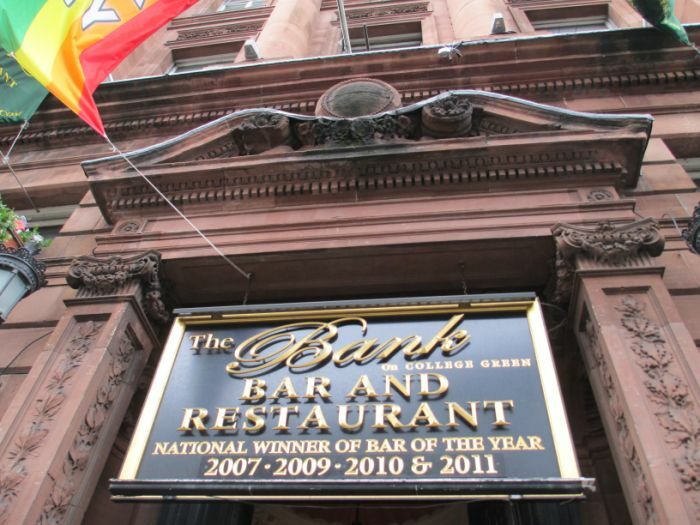 Just across the road from the Bank of Ireland, on College Green, is the 'The Bank' Bar & Restaurant. It is a splendid building with an even more impressive interior.